Commonly asked questions are separated in this area into questions geared toward: FAQ for students. How does your courses differ from other cabin crew courses? Our courses are designed and delivered by experienced cabin crew who had many years of flying and teaching experience. This means you learn from the experts. Our courses are targeted for employment preparation and to help you stand out from competition. It is precise, short and effective. We would require that you are 17 or above before we can enroll you on the course. 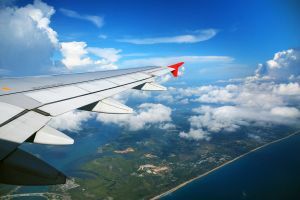 A few airlines require you to have minimum academic qualifications to be able to apply so if you want to fly for a particular airline we suggest you check their entry requirements separately before enrolment but typically this is English and Maths GCSE or equivalent. Please also refer to our website under admission info. Would this course help me with employment? Yes absolutely. 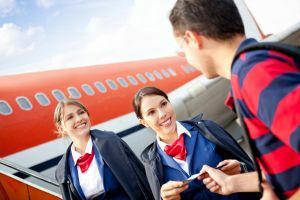 This course will give you a clear understanding of the role of cabin crew, and you will practice various assessments methods used by airlines for crew selection. All students undertake various drills, activities, tasks and exercises which will prepare you for the Airlines selection day. 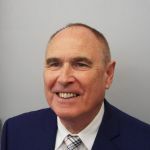 You will get the best support for your trainers who have many years’ experience of doing the job themselves. 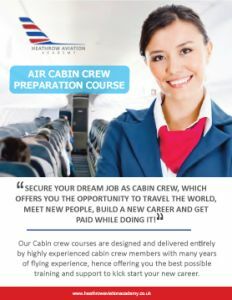 The Air Cabin Crew preparation course is delivered over 2 days of intensive training with the instructor and you will also receive additional pre-course and post-course materials which includes 2 days worth of home study. Will 2 days of training be enough to learn everything? The 2 days course will prepare you for the Airlines selection day. It will give you the right amount of training, practice and guidance to succeed in the airlines selection process. Please note that once you are selected by an airline, the airline offers all the new cabin crew recruits further training before they let you fly. This training is usually offered to you for further 4 weeks directly by the airline and covers all you need to know. Will you help us find work as cabin crew after the course? Yes , we will certainly guide you and support you with finding work after your course. Do I need to be able to swim in order to take the course? 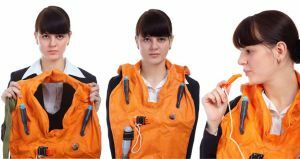 You do not need to be able to swim in order to take the course but in order to work as cabin crew you will be required to demonstrate that you can swim 25 metres unaided. All candidates will have an ‘Air Cabin Crew Preparation’ Course certificate and a completed portfolio to take with you and to put on your cv. You will also have a lot of confidence and knowledge when it comes to applying for jobs and presenting yourself to an airline. How is the assessment done on the course? The assessment combines a range of tasks, exercises, drills, group activities, role plays, mock sessions, tests such a psychometric , verbal , numerical etc. It also involves completing a portfolio as you progress within the course. Will I have a practical training on the course? 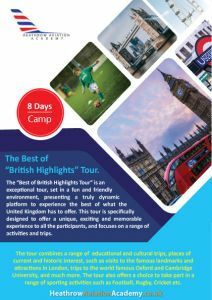 Yes, you will have several practical drills on the course such as safety demonstrations, passenger announcements, CPR, medical emergencies, group activities, role plays, mock up interviews etc. My English is not very good, can I still do the course? We have a lot of students’ from all over Europe and our instructors are able to support candidates as much as possible, who do not speak English as their first language. However we require that candidates have basic level of reading, writing, speaking and listening skills in order to follow the course. Are there job opportunities in this sector? 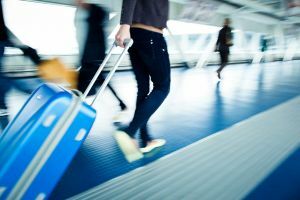 Yes, Cabin crew job opportunities are on the rise and the Travel and Tourism industry is expanding rapidly. Being able to speak more than one language is an advantage. We train in small groups of about 8 to 10 people which means you will have plenty of attention from your instructors.